Deck Lock Safety Cover Systems are a safe alternative to winterizing a swimming pool, providing peace of mind all winter long. No more water bags or tarp covers! No more leaves and debris! Deck Lock Covers are installed tight and flush with your pool deck keeping children and pets safe from the water below. Deck Lock Covers eliminate the process of pumping dirty surface water from your winter cover. 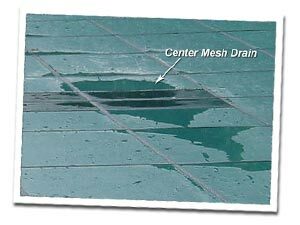 Rain or melted snow and ice drain through a Deck Lock Cover slowly bringing the pool water below closer to operating level as Spring approaches. As for leaves and debris, they will dry and blow off of the cover over the course of the winter. Cover installation and removal tools are included with Deck Lock Covers making these lightweight yet durable covering systems very easy to manage. Though it seems like an inexpensive alternative, rectangular safety covers are not designed for shaped or freeform pools. Some dealers will not tell you that this incorrect installation will not only destroy the cover but also VOID THE WARRANTY with any manufacturer. 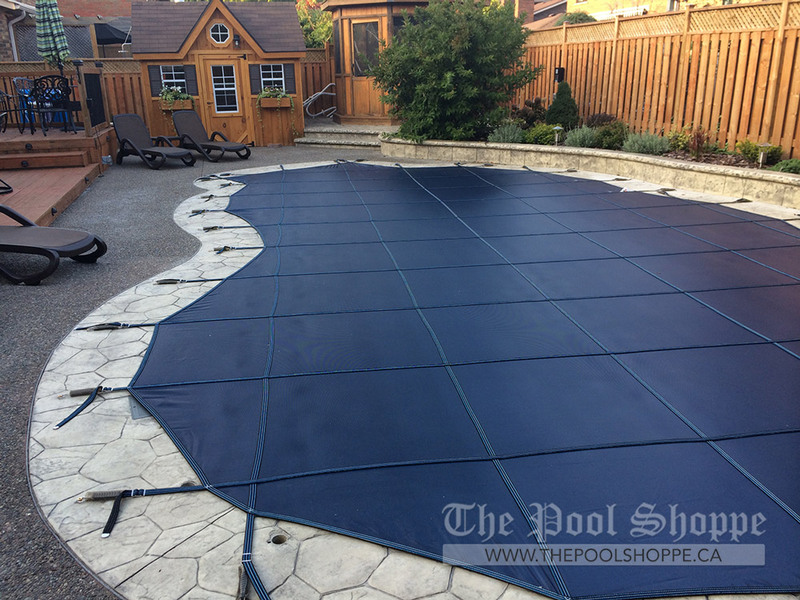 Protective rub strips are placed strategically around the perimeter of the pool cover so that as the cover moves up and down with snow loads, your pool coping and the cover, are protected. 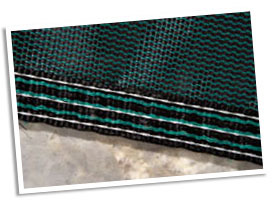 When a rectangular cover is placed over the wrong shape, protective strips are not placed in line with your pool’s shape, causing the straps and panels in those unprotected areas to eventually tear. Questions about our safety covers? 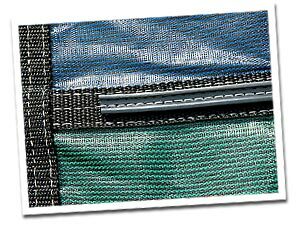 Triple white bonded polyester stitching is used on all webbing seams for visual inspection purposes. 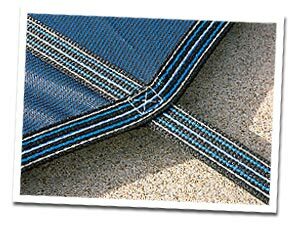 All cross-strap sections and perimeter points feature cross-stitched reinforcement. Specially treated U.V. resistant thread is used throughout the cover. Industry leading 22″ soft component rub strips protect the cover and your pool coping from excessive wear. 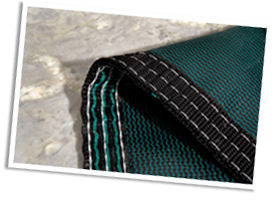 A durable grid of strapping on both sides makes our safety covers the strongest per square foot in the industry! Identification Code: An industry first! Each cover has a registered serial number sewn into the cover. If the cover ever needs replacing, a copy cover is manufactured lining up the new cover to your existing deck anchors! Note: A cover’s strength comes from its supportive structure – straps and anchors. By increasing the number of straps and anchors we not only increase the strength, durability and lifespan of the cover, but also reduce the gaps between anchors preventing the cover from flapping in the wind and allowing debris to pass underneath into the pool. Our safety covers are built in either 3′ x 3′ panels or 5′ x 5′ panels. Know the facts! We suggest that any shape other than a rectangle, be made in 3′ x 3′ panels for additional support. Contact Us and ask us why! 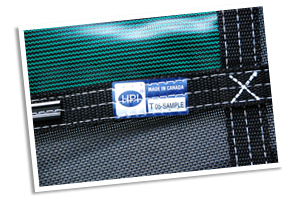 HPI Safety Covers carry a limited warranty with up to 15 years of protection. As rain or melted snow and ice pass through any safety cover, trace organics will also be introduced to the pool water below. Depending on water temperature, this can lead to opening up the pool to slightly cloudy conditions. Since there is no heavy debris to be removed from the pool, the pool water can be chemically treated to prevent or return it to clear and balanced conditions. See our Winterizing Instructions for more tips on protecting your pool during the winter months. Closing the pool later in the season and opening a little earlier can also help to prevent cloudier conditions. Also see Cover Material Options below. Depending on the amount of precipitation experienced over the course of winter, it is suggested to check the pool water level below the cover periodically to ensure that water levels do not exceed past the top of the pool skimmer. In the Spring, before removing and storing your Deck Lock Cover, clean and refresh the cover prior to removal by applying Natural Chemistry’s Spray-On Cover Cleaner. Simply attach to your garden hose and spray over the entire cover allowing the water to run into the pool. 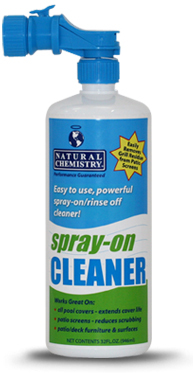 This refreshing safety cover cleaner will biodegrade in the pool water leaving your safety cover clean and ready for storage. Our most popular seller! Available in Tan, Blue, Black, Grey and Green. These durable covers block 90% of Ultra violet light from the sun to deter the growth of algae below. For customers preferring less UV passage, Deck Lock Cover Systems are also available in Bloc Mesh 99 and Aqua Master Solid Vinyl. Available in Tan, Blue, Grey and Green. These elite covers block 99% of UV and reduce the amount of organic debris passing through to the water below. Recommended for those with a short summer season. Available in Blue and Green. These solid safety covers fully block out UV light and only allow the passage of water and debris through one centre drain section only.